Precision Roofing – Commerical Roofing, Roof Repair, Roof Maintenance – Call us whether your have a hole in your roof or need a whole new roof! Call us whether your have a hole in your roof or need a whole new roof! 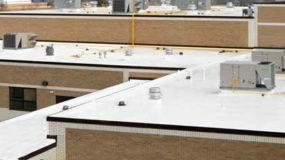 From industrial warehouses to self-storage facilities, Precision Roofing is the flat roof expert. We can install the entire roof or select portions of your church/school, commercial, warehouse/self-storage, healthcare or industrial building. Precision Roofing roofs buildings where residents live and patients come and go. Whether you need to replace your existing metal, rubber, or built-up roof, or you have a new construction project, we can take care of the roof. 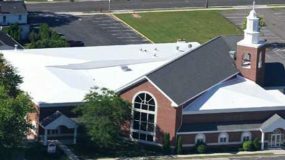 Precision Roofing has roofed churches for all denominations and public and private schools. The experts at Precision Roofing specialize in commercial and industrial flat roofing. Whether you need to replace your existing metal, rubber, or built-up roof; or you have a new construction project, contact Precision Roofing. Our experience includes all types of buildings: manufacturing/industrial facilities, healthcare, retail, auto dealerships, municipal buildings, churches, restaurants, warehouses, multi-unit housing, self-storage facilities, schools, funeral homes, and more. When you have a flat roof project, we'll begin with a complimentary, competitive proposal. of installing quality commercial roofing for southeast Wisconsin businesses. We have installed over five and a half million square feet of flat roofing (and counting)! 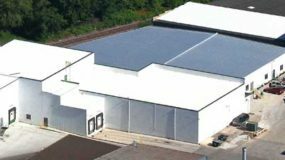 Precision Roofing recommends a single-ply commercial flat roof membrane for commercial and industrial roofs. This custom system is pre-engineered, prefabricated and manufactured to address your specific needs. Since nearly 85% of seams are completed at the factory when the roof system is manufactured, there is minimal need for field seaming. We hot weld all remaining seams during installation. Other installers use adhesive which can break down and cause leaks over time. Our heat sealing means your roof is virtually maintenance-free. Duro-Last® protects commercial and industrial building owners with a comprehensive, transferable 15- or 20-year warranty on labor and materials. Both provide maximum protection, including coverage against damage caused by ponding water and consequential damages that result from defects in the Duro-Last material.